Senate Minority Whip Bill Montford says he was reluctant to sponsor the bill to allow businesses to advertise on school buses, but calls it another source of funding for schools. Under the bill, half the money generated would go to a school district’s transportation budget, another 25-percent would go to the district board, and the rest would go to the district trust fund. The measure drew opposition from other committee members and some members of the public, like Donna Sanford of Crawfordville. Meanwhile, the Florida Beverage Association also spoke up. It says, contrary to media reports, its companies, which are of the non-alcoholic variety, would NOT be participating in the advertising should the bill become law. Tallahassee, FL – School districts are looking for new ways to raise revenue. 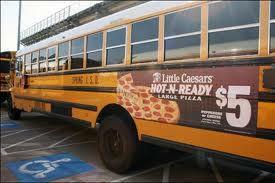 Regan McCarthy reports one idea under consideration in the legislature is to sell advertising spots on the sides of school buses.